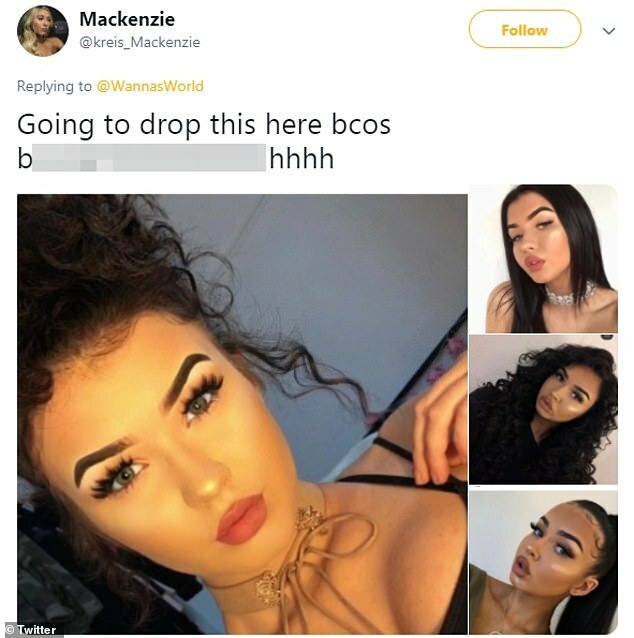 A serious Twitter debate has erupted about white social media influencers who are 'posing' as biracial women to gain a larger following, with dozens of users chiming in to voice their horror at the behavior. 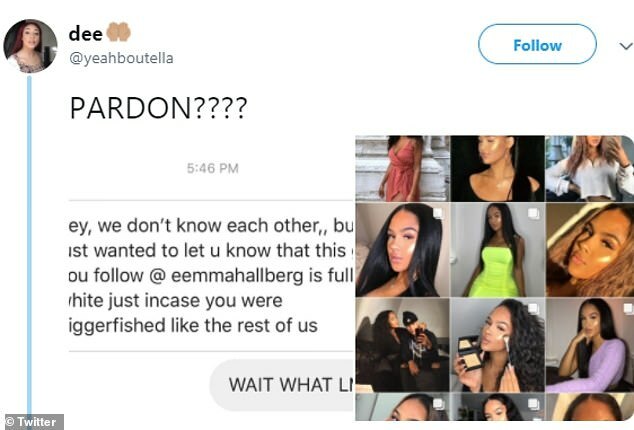 The topic first earned attention last week when a Twitter user accused a Swedish model and influencer named Emma Hallberg, 19, of darkening her appearance and altering her hair to appear more black or biracial. The revelation sparked a conversation online about cultural appropriation and what can be considered blackface. 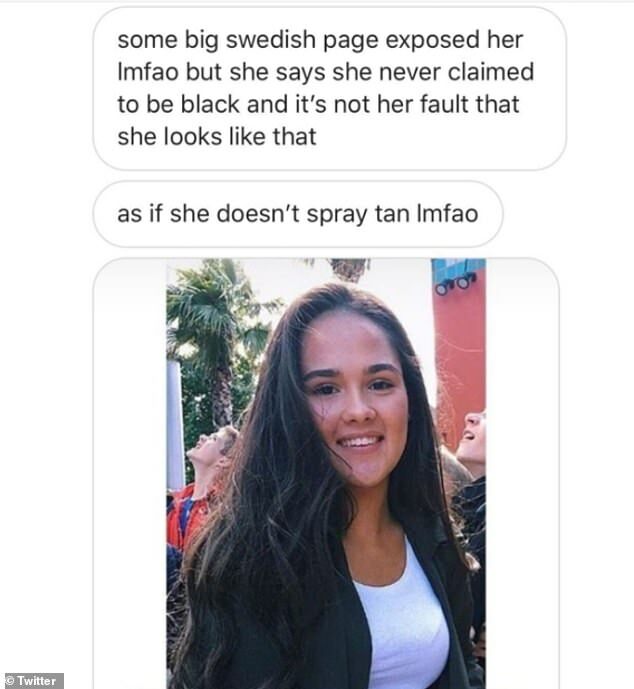 In pictures she shares on Instagram, Emma appears to have a deep tan, full lips and curly hair, despite being white. But other images and video show that she applies foundation several shades darker than her own skin to get that 'tan' look. 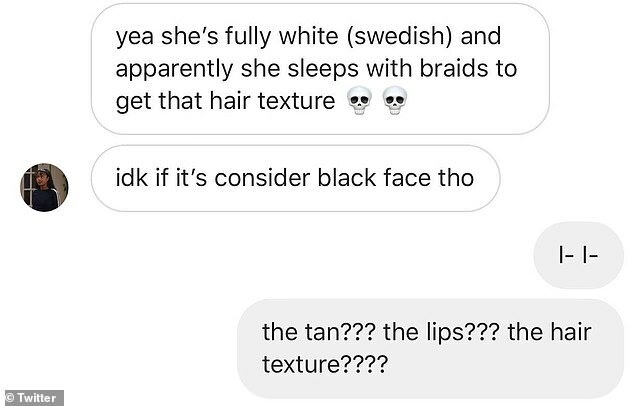 One of Emma's followers also revealed last week that the influencer sleeps in braids to give her hair 'texture', but the person was unsure if that would be considered blackface. 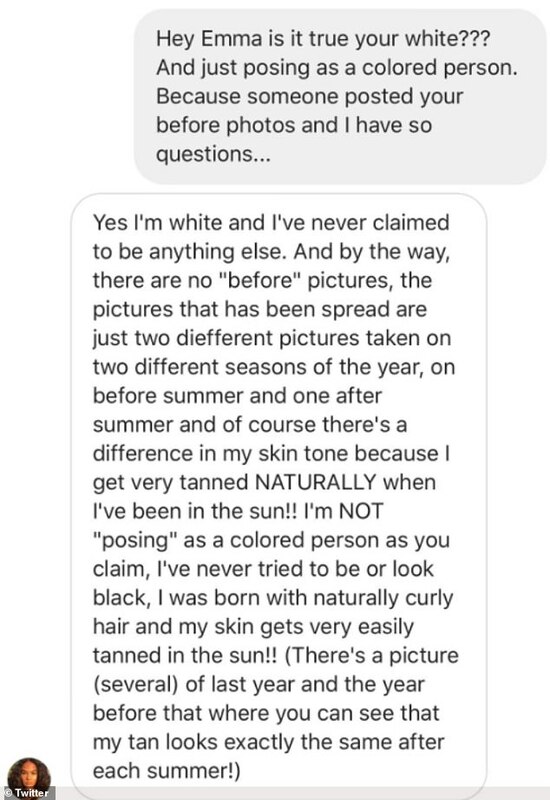 Inspired, someone messaged Emma on her Instagram account about her skin color. 'Hey Emma is it true you're white...and just posing as a colored person?' the message read. But this explanation did not appease people who believed the woman was going out of her way to purposefully appear biracial. In an interview with Buzzfeed, Emma explained the controversy and why she believes these claims are false accusations against her appearance. 'It made me sad that some of my natural features are hurting and upsetting people,' she told the news site. But not everyone has accepted that answer, including one person who said she is also from Sweden. 'I'm 100% Swedish like her,' a woman named Amanda wrote. 'There is no way in hell that's her natural tan. 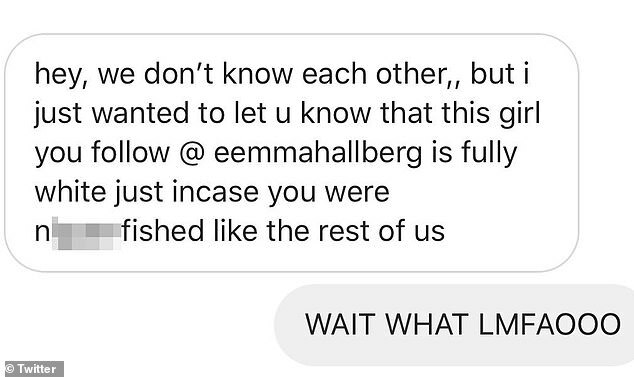 DailyMail.com has contacted Emma for a comment about these recent allegations. 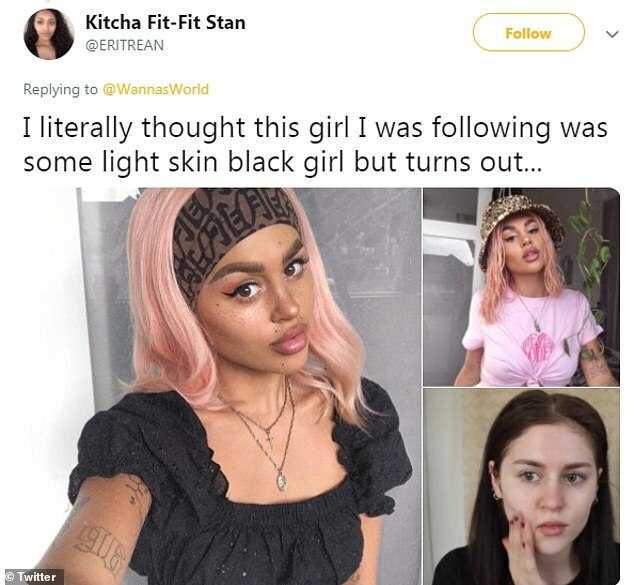 Of course, Emma is not the only influencer to come under attack for what has become known as 'blackfishing' — which means posing as a light-skin black or biracial person. Another influencer who came into the limelight this past year for posing as biracial is Victoria Waldrip, 18, who is known online by the name Woah Vicky. She was the center of controversy last year over claims she made that she is black. She was also accused of consistently appropriating black culture in videos and pictures. The influencer even went as far as to do a 23andMe test to prove her heritage. The conversation last week inspired a woman named Wanna Thompson, who is a freelance writer, to start a Twitter thread calling out other white influencers allegedly posing as biracial or black women. 'Can we start a thread and post all of the white girls cosplaying as black women on Instagram' She wrote. Multiple followers commented on her thread with their own examples of women on social media modeling exaggerated features typically seen on a black woman — including the larger lips, tanned skin and curly hair. In an interview with HelloGiggles, Wanna explained why this conversation was important to bring to light to people who might be following some of these women online. 'White women want the benefits of being black without dealing with the responsibilities that come with it,' she said. Wanna hopes these conversations online will help people realize the trends black women have catapulted into beauty and fashion industries. 'It’s clear that a lot of Black women are being overlooked for white women, but I believe that narrative will change because I refuse to stay silent on the matter,' she said.